Everyone has a favorite Dr. Seuss book, right? Today is the birthday of Theodor Seuss Geisel, who wrote many popular children’s books as Dr. Seuss. It’s difficult for me to choose just one, but Green Eggs and Ham stands out in my mind. I read this to my children and my students many, many times. 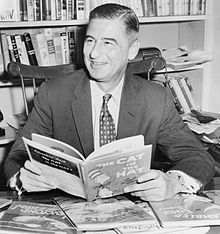 Other popular books he wrote include Green Eggs and Ham, The Cat in the Hat, Fox in Socks, The Lorax, One Fish Two Fish Red Fish Blue Fish, The 500 Hats of Bartholomew Cubbins, Hop on Pop, Thidwick the Big-Hearted Moose, Horton Hatches the Egg, Horton Hears a Who!, and How the Grinch Stole Christmas! Geisel’s birthday has been selected by the National Education Association for their annual reading initiative, the National Read Across America Day. This year the reading event takes place tomorrow, March 3. Read a book with a child tomorrow! This entry was posted in birthday, children, fantasy, fiction and tagged authors, bestseller, books, children, Dr. Seuss, family, fiction, illustration, Read Across America. Bookmark the permalink.